Carbon-based pigments are a group of dark-colored materials, which are classified according to the starting material used and their manufacturing process. Raman spectroscopy is an ideal technique for the identification of carbonaceous matter. Carbon-based pigments show broad bands between 1,300 and 1,600 cm−1 but they differ in position, width and relative intensity, allowing discrimination between them. 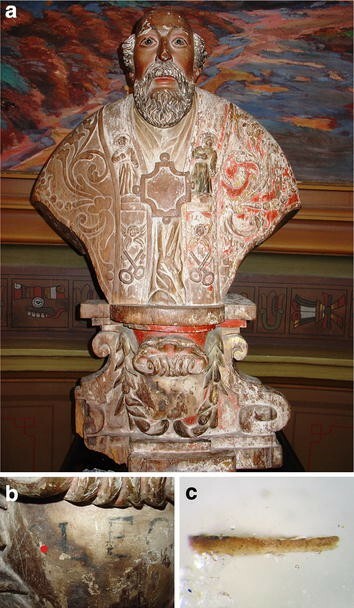 The aim of the present study was the identification of carbon-based pigments in four polychrome wooden sculptures from the Jesuit Mission La Trinidad in Paraguay. Carbon-based pigments are a group of dark-colored materials that are classified according to the starting material and the manufacturing process. They are composed by some form of elemental carbon and four groups may be distinguished: graphite, flame carbons, chars, and cokes [1–3]. On the other hand, black earths containing amorphous carbonaceous materials, such as Vandyke brown and Cassel earth have also been used as pigments. These humic-earth materials are composed of complex mixtures of natural organic substances derived from animal and vegetable sources with varying proportions of mineral matter . Carbon-based pigments have been identified in archaeological artifacts , rock art , and in easel and wall paintings [1, 3, 4, 7]. In most cases, the pigment was assumed to be charcoal or simply “carbon black”, a term generally used to mean any pigment based on carbon . As the precise identification of pigments is important for understanding the technology employed in the manufacture of an artwork as well as the resources available, an unambiguous characterization of carbon-based pigments remains a big challenge. Raman spectroscopy is an ideal non-destructive technique for the characterization of a variety of carbonaceous materials because it is sensitive to crystalline and amorphous structures, allowing the study of highly disordered materials, such as carbon-based pigments [9, 10]. The Raman spectrum of crystalline graphite consists of a narrow band at 1,580 cm−1 known as G band (‘graphite’) while disordered or microcrystalline graphite presents an additional band around 1,350 cm−1 known as D band, often called the ‘disorder’ band. Raman spectra of amorphous carbons are characterized by broad bands around 1,550 and 1,350 cm−1 and several spectral parameters of these bands such as their positions, relative intensities, and band widths provide structural information and have helped to discriminate between samples from different origins [9–11]. Recently, we have studied by Raman microscopy seven carbon-based pigments used in art and as references for archaeometric studies, together with a sample of commercial vegetable charcoal, in order to find relevant parameters to distinguish between the pigments . These references had been selected from ten carbon-based pigments previously studied in detail by a combination of FTIR-ATR, SEM–EDS microscopy and XRD to determine their structures and compositions . The selected pigments comprised graphite (crystalline carbon), lampblack and bistre (flame carbons), bitumen and ivory black (cokes), commercial wood charcoal (char), and Vandyke brown and Cassel earth (black earths). Reference carbon-based pigments from different sources showed similar Raman spectra with characteristic G and D bands in the range 1,350–1,600 cm−1 that differed clearly in position, width and relative intensity. The combined analysis of the spectral parameters showed that Raman microscopy allowed the discrimination of most of the reference pigments as well as the identification of carbon-based black pigments in two South American colonial paintings dated from the early 18th century . The aim of the present study was to extend this approach to the identification of carbon-based black pigments in four wooden polychrome sculptures (Figures 1, 2, 3, 4) produced during the so-called Colonial period (17th–18th centuries) in the Jesuit Mission of Trinidad in Paraguay. 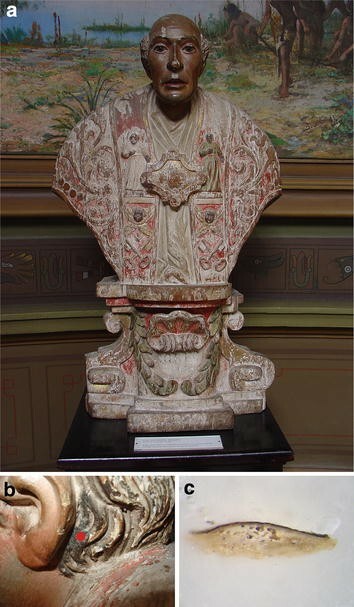 The sculptures are currently housed at the Museum of Natural Sciences, in La Plata, Buenos Aires province, Argentina and were brought to the Museum by the naturalist Adolfo de Burgoing during the last decades of the 19th century, after his trip to the Guaraní Jesuit ruins of Trinidad Mission (Paraguay), together with visits to San Ignacio Miní, Mártires, Santa María Mayor, Concepción del Bermejo, Loreto and Apóstoles Missions (Argentina). a Saint Gregorius Magnus; b sample location (SGM8) indicated by a red circle; c cross-section of sample SGM8. a The Trinity; b sample location (TRI8) indicated by a red circle; c cross-section of sample TRI8. a Saint Lion the Pope; b sample location (SLP6) indicated by a red circle; c cross-section of sample SLP6. a Saint Benedict the Black; b sample location (SBN1) indicated by a red circle; c cross-section of sample SBN1. Images installed in churches, convents or small chapels were part of what has been identified as the process of evangelization done under the Spanish domain. Virgins, saints, and christs were manufactured in workshops by Spanish, indigenous and creoles people, who used diverse materials—wood, stone, etc.—to carve and paint the sculptures . The inventories left by the Jesuits after their expulsion in 1767 give account of many materials—pigments such as Prussian blue, vermillion, minium, carmine, verdigris, among others—that were used by them. Recently, we have identified the pigments minium, vermilion, red earth, madder lake, copper resinate and green earth, together with calcite and gypsum as plasters, in three of the sculptures studied [15, 16]. In this paper microsamples from black areas of the Jesuit sculptures were analyzed by Raman microscopy, together with scanning electron microscopy with energy dispersive X-ray microanalysis (SEM–EDS) and Fourier transform infrared spectroscopy (FT-IR) as complementary techniques. The results show the potential of Raman microscopy to discriminate the carbon-based pigments of different sources used in the polychromy of the sculptures and contribute with new information on colonial art materials. 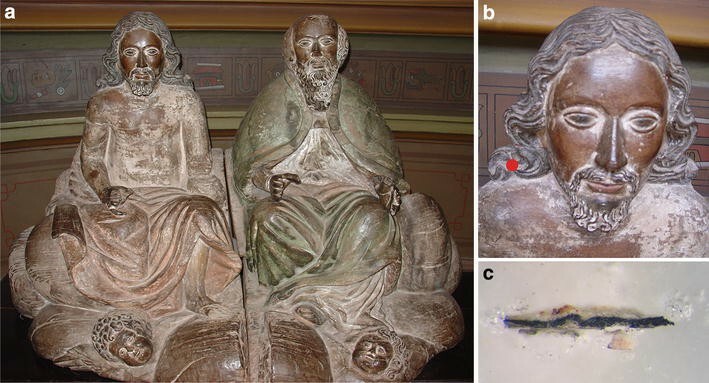 Four microsamples were extracted from black areas of the wooden sculptures of Saint Gregorius Magnus (Figure 1), The Trinity (Figure 2), Saint Lion the Pope (Figure 3) and Saint Benedict the Black (Figure 4). The samples were labeled SGM8, TRI8, SLP6 and SBN1, respectively (Table 1). A small quantity of each sample was mounted in an acrylic transparent resin (Subiton, Laboratories S.A., Argentina). Thin and polished cross sections were prepared from the samples according to traditional techniques of our laboratory. Carbon-based reference pigments were supplied by Zecchi, Belle arte e restauro [graphite (GRZ), lampblack (LBZ), bistre (BSZ), bitumen (BTZ), ivory black (IBZ), and Earth of Kassel (EKZ)] and Van Dyck (VDK) by Kremer Pigmente. A sample of commercial algarrobo (Prosopis sp.) charcoal (CWC) was also included. Elemental chemical analyses of the layers of the cross section of each sample were obtained by using a Philips XL 30 ESEM scanning electron microscope. The samples were coated by sputtering with a thin (less than 80 Ẳ) layer of gold. Several measurements were performed on selected areas or certain grains of each layer of the sample. Infrared spectra of painting samples were obtained on a Nicolet Magna 550 Fourier transform spectrometer. For each sample 32 scans were recorded in the 4,000–400 cm−1 spectral range in the transmittance mode with a resolution of 4 cm−1. Spectral data were collected with OMNIC 7.3 (Thermo Electron Corp.) software. The KBr pressed disk technique (1% sample in KBr) was used. Raman spectra were recorded on a LabRAM HR Raman system (Horiba Jobin Yvon), equipped with two monochromator gratings and a charge coupled device detector (CCD). An 1,800 g mm−1 grating and 100 μm hole resulted in a 1.5 cm−1 spectral resolution. The spectrograph was coupled to an imaging microscope with 10×, 50× and 100× magnifications. The Ar laser line at 514.5 nm was used as excitation source and it was filtered to give a laser fluence or density power at the exit of the objective lens varying from 10 to 200 W mm−2. Several measurements were performed, adjusting the laser fluence to 50 W mm−2, in order to ensure that the heating produced by the laser was minimized and the sample was not altered. Typically, for a 50× magnification, the spot size diameter was of about 5 μm. To register the Raman spectra of the polychrome sculpture samples, at least ten different points in each sample were randomly taken under the same conditions. Each spectrum was averaged over four scans with a collection time between 30 and 120 s for each scan, depending on the signal intensity. Raman spectra of the reference pigments were registered under the same conditions as for the sculpture samples, collecting spectra from ten different points in each sample. Black layers of samples SGM8, TRI8, SLP6 and SBN1 showed Raman spectra with D and G broad bands (Figure 5), characteristic of amorphous carbon. On the other hand, spectra from SGM8 sample also revealed the presence of iron-manganese oxide compounds. Raman spectra of carbon-based pigments in samples, SGM8, SBN1, SLP6, and TRI8. Position, width, and relative intensity of D and G bands were analyzed for each sample and compared to that of seven references, previously studied by micro-Raman spectroscopy . Quantitative parameters from the Raman spectra of the samples were obtained by conventional fitting procedures based on Lorentzian and Gaussian profiles . The baseline was fitted using a straight line in the 1,000–1,900 cm−1 range, in order to minimize the number of parameters involved. Table 2 shows the averaged parameters over ten spectra for each sample (references and sculpture samples); errors were calculated taking into account the fitting errors and the statistical deviation over ten measurements. Data for reference pigments were published in . In Figure 6, references and sculpture samples were arranged according to the increasing value of ID/IG ratio, suggesting different sources for the carbon-based pigments in samples SGM8, TRI8, SLP6, and SBN1 (0.67, 0.75, 0.95, and 0.82, respectively). ID/IG ratio for references (EKZ, VDK, CWC, GRZ, BTZ, BSZ, LBZ, IBZ) and sculpture samples (SGM8, TRI8, SBN1, SLP6). Sample SGM8 showed D and G band positions (1,378 and 1,587 cm−1, respectively) and ID/IG ratio (0.67) very similar to those for dark earth references VDK and EKZ (Table 2), except for the full width at half maximum (FWHM) of band D (ωD), which showed a larger value (455 cm−1) than VDK and EKZ (237 and 228 cm−1, respectively). In addition to this, a broad band around 600–645 cm−1 indicated the presence of iron-manganese oxides, which is in good agreement with previous analysis of the black layer by SEM–EDS (Table 1) . The presence of these oxides could produce a broadening of the D band, affecting the fitting procedure . The Raman spectral parameters of sample SGM8 suggests the use of a carbon-based pigment such as Vandyke or Cassel earth, which contain humic substances together with a mineral fraction composed by clays and oxides . The Raman spectrum of the plaster layer showed characteristic peaks for gypsum (CaSO4·2H2O) and anhydrite (CaSO4) at 1,009 and 1,018 cm−1, respectively (Figure 7) . The IR spectrum of sample SGM8 (Figure 8) was dominated by characteristic bands of gypsum (CaSO4) at 3,554, 3,406, 1,689, 1,628, 1,130, 673, and 600  of the plaster layer, together with weaker bands at 3,900–3,000, 1,740–1,600 and 1,470–1,250 cm−1, which could be attributed to humic substances from an earth carbon-based pigment . Raman spectra of the ground layer of samples SGM8, SLP6 and SBN1 (SBN1a) and the white layer of sample SBN1 (SBN1b). FT-IR spectra of samples TRI8, SGM8 and SLP6. Sample TRI8 showed D and G band positions (1,357 and 1,593 cm−1, respectively) and ID/IG ratio (0.75) similar to charcoal (CWC) and graphite (GRZ) references (Table 2). Regarding the band width of the G band, samples TRI8, CWC, and GRZ showed the lowest values of ωD (84, 75 and 67 cm−1, respectively), indicating the highest degree of graphitization among the references and sculpture samples. SEM–EDS analysis of the black layer in TRI8 revealed the presence of silicon, calcium and sulfur, together with minor amounts of aluminium, potassium, iron, chloride, and magnesium (Table 1). Minor elements as potassium and chloride could derive from plant material suggesting the use of wood charcoal as the black pigment . The FTIR spectrum of sample TRI8 (Figure 8) showed typical vibrations of calcium carbonate at 1,432 and 875 cm−1 together with bands at 1,114, 673 and 599 cm−1 attributable to gypsum  in accordance with the presence of calcium as the major element and sulfur by SEM–EDS analysis of the plaster layer of TRI8 (Table 1). The bands at 2,921 and 2,852 cm−1 are characteristic of lipids while the band at 1,632 cm−1 together with the broad band centered at 3,405 cm−1 indicated protein. Lipid and protein staining tests on the cross-section of sample TRI8 with Sudan black (lipid) and Acid Fuchsin S (protein) confirmed the presence of a mixture of lipids and protein in the ground layer . Sample SLP6 shows the highest ID/IG ratio (0.95), which is very similar to references IBZ (0.94) and LBZ (0.91). On the ground layer, the Raman spectrum showed peaks at 1,007 and 1,014 cm−1 characteristic of a mixture of gypsum and anhydrite (Figure 7). SEM–EDS analysis of the black layer revealed the presence of calcium, sulfur and silicon, together with minor elements as aluminium, potassium, iron and copper (Table 1). The absence of phosphorous discarded the presence of a bone black pigment. The FTIR spectrum (Figure 8) of SLP6 was dominated by gypsum bands at 3,544, 3,406, 1,683, 1,625, 1,146, 675 and 603 cm−1 from the ground layer, together with bands at 2,921 and 2,848 cm−1, characteristic of lipids. No bands due to calcium carbonate characteristic of carbonated hydroxyapatite were observed . These results suggest the use of lampblack, which is soot obtained from burning oil . The Raman spectrum of the black layer of SBN1 showed D and G band positions (1,374 and 1,580 cm−1, respectively) and ID/IG ratio (0.82) similar to those of bistre (BSZ) (Table 2), a carbon-based pigment prepared from wood soot . SEM–EDS analysis of the black layer showed the presence of lead together with minor amounts of calcium, silicon, potassium, aluminium, and iron (Table 1). The presence of potassium is typical for the carbonization of wood. The black pigment was applied over a white layer of basic lead carbonate [PbCO3·Pb(OH)2] known as lead white , as determined by the presence of lead in the SEM–EDS spectrum of this layer (Table 1) and a strong peak at 1,055 cm−1 together with a weak one at 1,050 cm−1 in the Raman spectrum of the white layer  (Figure 7). The characteristic peak of anhydrite around 1,020 cm−1 was observed in the Raman spectrum (Figure 7) of the ground layer, which is suggested to be composed of a mixture of calcium sulfate and lead white due to the presence of calcium and sulfur together with minor amounts of lead in the SEM–EDS analysis. The FTIR of SBN1 was not recorded due to the low amount of sample available. In this study, carbon-based black pigments were identified by Raman microscopy in four Jesuit wooden sculptures produced in the 18th century. The images show a poor conservation condition in their polychrome layers as well as in their wood support, due to old transfers and to light and humidity exposure through time. Nevertheless, the fact that they have never been repainted—as usually happens with this kind of religious images—enabled us to develop scientific research on their original painting. The combined analysis of Raman spectral parameters (width, position and intensity of G and D bands) of the painting samples and reference pigments determined by curve fitting was successfully applied to the identification of bistre, wood charcoal, lampblack, and a humic earth pigment in the Jesuit sculptures. Wood charcoal and bone black had previously been characterized by this methodology in two colonial paintings dated from the early 18th century . The chemical information obtained on the black pigments used in the manufacture of the polychrome sculptures contributed to increase our knowledge on the available resources at the Jesuit Mission of Trinidad and expands our knowledge on Colonial art. At the same time, this kind of studies deeply helps in future preventive conservation and restoration labors. MSM and EPT coordinated the study and prepared the draft manuscript. BG recorded the FT-IR spectra and prepared the cross-sections of the samples. EH, ED and MR performed the Raman microscopy analyses. EPT, EH, MR and MSM carried out the interpretation of the results. GS selected the Jesuit sculptures in the frame of our project on Colonial sculpture (PICT2011-1327) and defined the sampling. All authors have read and approved the final manuscript. We acknowledge the Consejo Nacional de Investigaciones Científicas y Técnicas (CONICET) and the Agencia Nacional de Promoción Científica y Tecnológica (ANPCyT) for financial support. We wish to thank Fernando Marte for collecting the samples. MSM, MR, GS and EPT are Research Members of CONICET.